ROME, Italy – Today, World Food Day, we are confronted with the failure of our global food system: 805 million people are going hungry while obesity affects over 2 billion of us. The hungry are mostly the rural poor living in developing countries, predominantly peasants and other small-scale food producers, from Africa, Asia Nearly one of every nine people go to bed hungry every night, but not Adolfo and his family, despite the fact that he is from an area devastated by the effects of climate change and flooding, the Lempe Valley in El Salvador. Adolfo knows from first hand experience that agricultural diversity and saving traditional seeds are essential to the livelihoods of small scale food producers, who, in turn, play a vital role in feeding local people. Governments around the world have sidelined small-scale food producers for decades, pushing millions of them into hunger. Yet, even today, most of the world’s food is still grown by them, using traditional seed varieties and without the use of industrial inputs. 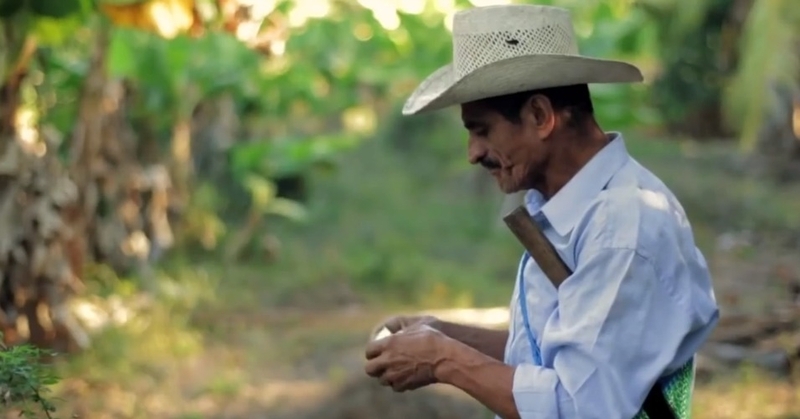 Peasants like Adolfo are the primary food producers feeding the world today. And we desperately need them, not more industrial farming, if we are to feed the planet in the context of climate change and widespread degradation of natural resources. In Africa, peasants grow almost all locally consumed food. In Latin America, 60 per cent of farming, including meat, comes from small-scale family farms. In Asia, the global rice powerhouse, almost all rice is grown on farms of less than 2 hectares. Yet industrial farming - based on monocultures, hybrid seeds, and chemical pesticides and fertilizers - is still promoted heavily by agribusinesses and some governments as the best way to provide food for the planet. Yet, evidence shows that industrial farming is destroying the resources we rely on to produce our food. Desertification of soils, a diminishing genetic pool, and dead-sea zones from fertilizer runoff are just some of the effects of industrial farming. Climate change is another huge challenge that could bring down agricultural productivity significantly by 2050, especially in developing countries. Ironically, industrial farming is itself a major contributor to climate change because of its reliance on fossil fuels and fertilizers. Despite this, backers of industrial agriculture point to our growing population and the need to produce more food as a justification for ignoring its real environmental consequences. But we know that producing more food and increasing yields are not the sole challenges. In fact, we already produce enough food to feed our population today and in the future. The problem is not lack of food, rather its unbalanced distribution. Access to food is dictated by wealth and profit rather than need, when "free trade" is promoted over the Right to Food. As a result, half the world’s grain now feeds factory-farmed animals and a huge proportion of food crops are turned into agrofuels to fuel cars, taking food from the hungry and diverting it to wealthy consumers. Our real hunger challenge today is to raise incomes and sustain the livelihoods of small-scale food producers, enabling them to feed themselves and local people sustainably. Facing this challenge, the 'food sovereignty' movement has emerged as an incredibly effective alternative to the industrial food system. The movement for food sovereignty is backed by more than 300 million small- scale food producers as well as consumers, environmentalists and human rights Food sovereignty is fundamentally different from food security. A country focused on achieving food security does not distinguish where food comes from, or the conditions under which it is produced and distributed. National food security targets are often met by sourcing food produced under environmentally destructive and socially exploitative conditions that destroy local food producers but benefit agribusiness corporations. On the other hand, food sovereignty promotes community control of resources and access to land for small-scale producers. It prioritizes peoples’ ownership of their food policies. Importantly, it demands the right to healthy and culturally appropriate food produced through agroecology – the application of ecological principles to farming. In the past few years, new evidence from several United Nations agencies has recognized agroecology as the most effective way to tackle the multiple crises of hunger, environmental damage and poverty. A 2011 analysis of agro-ecology (pdf) found that it has the potential to double small farmers’ food production in 10 years. Even a fraction of such a gain would go a very long way to substantially decrease world hunger. The evidence is clear but changing the food system is difficult. The power of seed and pesticide companies such as Monsanto and Syngenta, of gigantic supermarkets such as Wal-Mart, and of grain traders such as Cargill has grown so strong that they exert a massive influence over national food policies. This ensures that agribusinesses still receive billions of dollars in subsidies and policy support. The solution to global hunger is within our grasp, but it requires a fundamental reform of the global food system: a wholesale shift from industrial farming to agroecology and food sovereignty. Kirtana Chandrasekaran is food sovereignty program coordinator at Friends of the Earth International. Martin Drago is food sovereignty program coordinator at Friends of the Earth International.